Her acceptance speech for the Texas Bluebonnet Award for Because of Winn-Dixie is the stuff of legend. All these years later, people are still looking for a video or transcript of her talk. Here DiCamillo reads from her new book The Magician's Elephant. Greg Pincus at The Happy Accident has a highly entertaining post "To-Be-Read Piles – Small, Large, and Extra Large!" Go read it!!! You will feel better. Nice to see I am not alone. My niece said my " collection" was "a book EXPLOSION!" I had it all sort of organized but this summer, things got away from me. Improvements are in the offing. A little more of The Lightening Thief. Thank you, entling no. 3. Clever entling no. 1 pointed me in the direction of this un-embeddable official trailer to Tim Burton's Alice in Wonderland. I had not seen it yet. 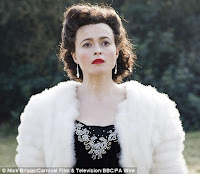 Helena Bonham Carter will play Enid Blyton in an upcoming biopic of the writer's life. I note that Matthew Macfadyen and Denis Lawson (!!! !Wedge Antilles!!!!) will play her two husbands. This BBC4 Trailer will NOT play on this side of the pond. A lashing of ginger beer, anyone? Rufus Sewell is Tom Builder and Matthew Macfadyen is Prior Philip! Two friends, Bonnie and Samantha, love horses. They know all the horses in Currawong Creek. It is their familiarity with the different personalities and manners of these horses that help them figure out that the horse Sam's father uses for his police work has traded places with another brumby mare that is the same color and size. The girls work with the new horse to train it for the job so Sam's father will not detect the switch. Roland Harvey's watercolor and ink illustrations take this story to the next level. Countless tiny, humorous details of life in Currawong Creek are depicted and invite the reader to study the pages closely, shades of "Where's Waldo." The characters and horses are expressive and full of life. The illustrations will beautiflly support emerging readers who are just beginning to read with fluency and discovering the pleasures of "chapter books." Alison Lester has provided a little glossary of Australian terms so 'yanks' will understand expressions like "double-dinking" and "brumby" -- although the context of the story and the pictures make clear what the expressions mean. A very 'jolly' little series to be sure! The stunning cover art by (her husband) Jim DiBartolo compels you to reach for the book. Now, Laini reports that 4 weeks after the birth of their beautiful Clementine, she is writing whole chapters. Honestly, 4 weeks after the birth of my children, I thought I was having a great day if I could get a shower. My brain was in such a hormonal stew, I was happy to remember where I put the entlings, much less WRITE A BOOK. I stand in awe, Laini. She has shared some of Jim's art from her new book, Lips Touch, Scholastic, 2009. Here's a trailer. They will be reaching for this one! Now, where did I leave entling no. 3? Oh, that's right, she is at college. This story from NPR makes me very sad. Reading Rainbow comes to the end of its 26-year run on Friday; it has won more than two-dozen Emmys, and is the third longest-running children's show in PBS history — outlasted only by Sesame Street and Mister Rogers. My family watched Reading Rainbow from Day 1 and continued tuning in for years and years and years. The theme song was uplifting and inviting, "Take a look, it's in a book - Reading Rainbow." It became a sort of soundtrack for our day when my children were younger. entling no. 1 was a wee tyke when the first Reading Rainbow episode aired. Lavar Burton was an enthusiastic and gracious host. I was raised listening to Robert Keeshan (Captain Kangaroo) read classics like Mike Mulligan's Steam Shovel and Make Way for Ducklings. Reading Rainbow celebrated the NEW classics. This was when we became aquainted with Bringing the Rain to Kapiti Plain, Imogene's Antlers, Perfect the Pig, and A Three Hat Day. The kid's reviews at the end of the show were a new twist. Let the kids, speak for themselves and recommend book titles. That had never been done before. The books were wonderfully narrated, with clever pan and scan editing of the illustrations. This series celebrated reading-aloud and the stories leapt through the television screen and into our hearts. Friends to know and ways to grow - Reading Rainbow.